Knowing about growing seasons and what ingredients are at their best right now is the first step to making great food. In Japanese Farm Food , of which I received a review copy, Nancy Hachisu writes: “Touching vegetables while they are living is something every cook should do… Learning to trust your instincts in cooking is the only way to get beyond the recipe, and the more you touch farm vegetables, or the more you observe the seasonal fish available, the more you will be able to do this.” Hachisu visited Japan in 1988 intending to return to the US for graduate school. Instead, she met and fell for an organic egg farmer, married him the following year, and has since lived on a farm in Saitama prefecture. With fresh vegetables from the farm and other carefully chosen artisanal ingredients made nearby, she has developed her own take on traditional Japanese farm cooking over the years. Since many of the dishes tend to be made with very few ingredients, she urges you to find the best version of each one of them. By tasting different types of soy sauce, sesame oil, and canola oil, you can then choose ones with the flavors you like most. The book includes pre-meal bites, soups, egg dishes, noodle and rice dishes, vegetables, seafood, meat, and desserts. There are wonderfully simple things like raw zucchini with toasted sesame seeds, a relish made of salt-massaged napa cabbage with citrus zest, and quick-pickled daikon and carrots. Other dishes I want to try are the Miso Soup with Small Clams, the Egg Custard Pots with Asparagus and Peas, the Stir-Fried Celery and Red Pepper with Soy Sauce, the Citrus and Vinegar-Marinated Halibut, and the Tangerine Ice Cream. First, I had to try making homemade udon. The Hachisus use home-grown wheat for their udon dough, but I made do with store-bought cake flour and whole wheat pastry flour. The dough consists of salt dissolved in water that’s added to flour. That’s it. It’s a very firm dough, and it takes some work to knead it into a cohesive state. Once the dough forms a ball, it’s placed in a plastic bag so you can step on it. That might seem weird, but trust me, it’s a lot more fun than kneading by hand. You just step on the dough to flatten it in the bag. Then, remove the dough, fold it in thirds, place back in the bag, and repeat a few times. After being stepped on a few times, the dough becomes much more pliable. It's then easy to flatten it into a shape to run through a pasta machine. It was left thicker than spaghetti at about one-eighth inch, and it was cut on the thin linguine cutters at lengths of about one foot. The noodles were tossed with a little flour to prevent sticking. 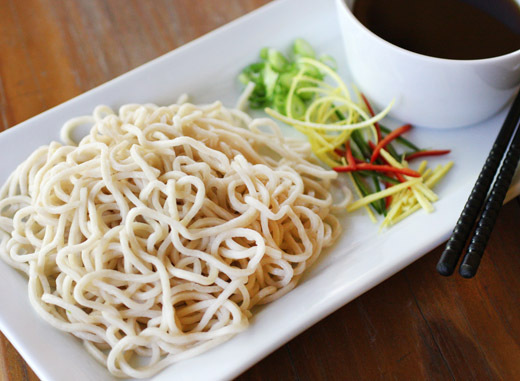 The quickly boiled noodles were served with a dipping sauce and garnishes. For the dipping sauce, rather than making the traditional sauce with dashi as suggested in the book, I made a vegetarian dashi with konbu, wakame, and dried shitakes. The dashi was combined with kaeshi which is a mix of mirin, sugar, and soy sauce. For garnishes, I used citrus zest, sliced green onions, and slivered chiles. The texture of the noodles was light and springy, and the whole wheat flavor of the flour came through. It must be incredible to make them with your own home-grown wheat. And, that’s really what this book teaches. By taking care in choosing your ingredients and by cooking thoughtfully, you’ll be making the most simply delicious meals. Tadaaki was always the noodle maker in our house. 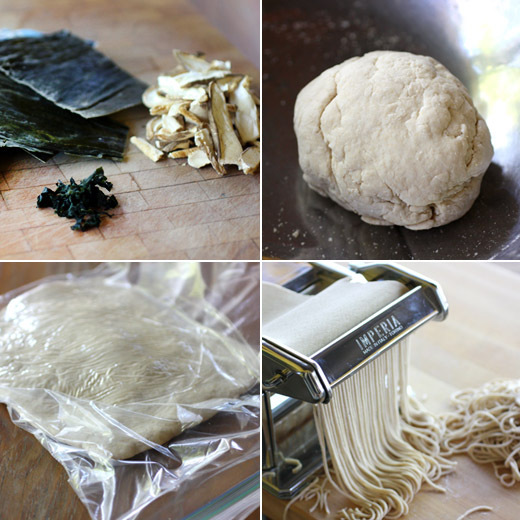 When I developed this recipe for an article I wrote a few years ago, I had Christopher roll out the noodles because I was busy (and a bit intimidated). I promised him he only had to roll enough for us to shoot the photo for the article, so he obliged. But at the end of the shoot, I was left with the rest of the dough and no Christopher. He showed me how to adjust the pasta machine, and I discovered how simple making noodles is. And my noodles turned out to have the perfect thickness. Dissolve the salt in 2/3 cup (160 cc) water. Measure the flour into a large mixing bowl. Add the salt water and mix until the dough holds together. Knead until smooth and pliable, then transfer to a heavy plastic bag. Pat the dough out to a 2-inch (4-cm) thick rectangle and knead further by rhythmically and firmly treading on the dough. Remove the dough from the bag, fold in thirds, and repeat the treading process a few times. (Or process with a metal blade in a food processor until the dough is crumbly and knead by hand.) Udon dough, like pasta dough, is dense and semidry, otherwise it will stick when rolled. Roll out with a pasta machine, making rectangles about 2 feet (60 cm) long by 1/8 inch (3 mm) thick. Cut the noodles on the thin linguine setting and cut in half horizontally for 1-foot (30-cm) lengths. Flour the cut noodles as you finish each batch so they will not stick together. Alternatively, roll out into a rough oblong shape on a counter surface with a 30-inch (75-cm) long dowel 1 1/2 inches (3 cm) in diameter. Roll from the center out, periodically rolling the dough around the dowel to keep from sticking on the counter. When the dough has reached the desired thickness, roll it around the dowel, slide the dowel out, and gently flatten the roll of dough to cut. Slice into 1/8-inch (3-mm) wide strips with a broad-bladed, razor-sharp knife. Fill a large stockpot with hot water and bring to a boil. Set a large mixing bowl in the kitchen sink and fill with cold water. Scoop up half of the raw udon and boil for 2 to 3 minutes, depending on thickness. The noodles should be softer than pasta but not mushy. Plunge the noodles into the bowl of cold water and refresh under cold running tap water. Shake off and swirl the small bunches into 3 attractive piles arranged on a dinner plate. Cook the rest of the udon in the same fashion. 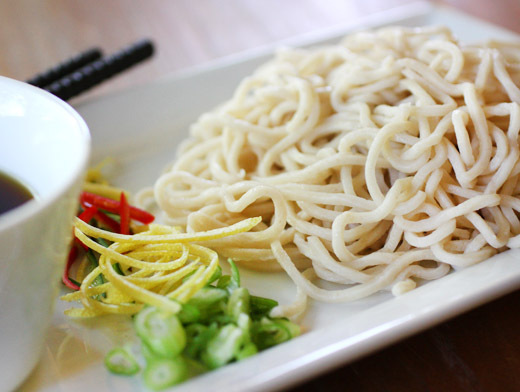 Dip the udon noodles in a small bowl of dipping sauce (tsuyu) with flavor garnishes (yakumi). Slurping is de rigueur in Japan. Flavor Garnishes Yakumi: Use finely slivered citrus peel, finely chopped fresh green chile, slivered fresh ginger, torn sansho leaves, a chiffonade of shiso leaves, or finely chopped scallion or chives. Each diner sprinkles the desired garnishes into a small bowl of dipping sauce. This “sauce” (which is more like a soup) can be served hot or cold, depending on the season. Good for dunking udon, soba, and somen noodles. Flavor the dashi with the kaeshi and use at room temperature, cold, or slightly warm, depending on your mood or the season. Kaeshi is an ingenious concoction that flavors dashi when making dipping sauces for noodles and tempura, or a hot broth for a noodle soup. While not the farm kitchen method, I was beguiled with how kaeshi relates to the dashi as a building block and could not leave it out of the book. Andrew, who works at our friend’s soba restaurants, was kind enough to walk me through the process (and approve of the results). Bring hon mirin to a simmer over high heat and cook, stirring constantly, until you no longer smell alcohol (3 to 5 minutes). Stir in the sugar and continue cooking (and stirring) until the sugar granules have dissolved. Add the soy sauce and watch as the kaeshi heats up and comes almost to a boil. You will see tiny bubbles form on the perimeter—remove the pan from the heat as soon as the entire surface of the kaeshi becomes a creamy tan from minute bubbles. Store for up to a year in the fridge. Dashi is probably the most important building block in Japanese cooking. Many chefs (especially those from Kyoto) wax poetic about the special methods they employ to draw out the natural umami of the konbu and katsuobushi when making dashi. Even the water must come from the Kyoto area. Our dashi is a bit more straightforward and quite tasty, despite our more laissez-faire attitude and lack of Kyoto water. We use well water from our family well, and it works just fine. I’m sure the water wherever you live will work just as well. The important thing to remember here is that dashi—or for that matter any food—should not become an obsessive chore. If you start with great ingredients, your food will taste good. Place the konbu in a medium saucepan containing 2 cups (500 cc) of cold water. Bring almost to a boil (you will see minute bubbles form on the edges of the konbu) and remove the konbu. Throw in the dried bonito shavings and simmer friskily, but not crazily, for 8 minutes. Remove from the heat and let stand 8 minutes. Set a small fine-mesh strainer over a 1-quart (1-liter) measuring cup and pour the dashi through the strainer to remove the dried bonito shavings. You should have 1 1/4 cups (300 cc) dashi. If you do not, add water (pouring through the strainer holding the strained katsuobushi) to make the amount of liquid needed. Use within a day or so, if kept chilled in the fridge. Lisa, that's so cool that you are making your own udon! We are Japanese food fiends around here. I went through a huge dashi/soup making phase. Reading you post this morning reminds me to get back to it. OK, I'm totally impressed that you made homemade udon. I've never even made homemade pasta. Looks delicious! I, too, am really impressed at the homemade udon! you dazzle me so, lisa. i've never even eaten an udon noodle, much less considered making one. what a superstar. Beautiful post. I can't believe you made these homemade noodles. Well done! I could not believe what my eyes were reading...you made udon? That is awesome...I am a big fan of udon noddles, but never, never thought in making my own. Looks beautiful! I've heard so many good thinks about Japanese Farm Food and your review mirrors what I have read. I am so impressed that you made the udon noodles, they are spectacular! Love love love udon! My first choice of noodles for soup noodle. Definitely going to try making fresh udon one day. That's incredible! Can't believe you made Udon noodles - Bravo, they look fantastic Lisa and with some really tasty garnishes!